(Bloomberg) -- The Czech central bank kept borrowing costs unchanged, declining to resume Europe’s fastest monetary-tightening campaign as it waits for more clarity about global the economic slowdown and domestic inflation risks. The cautious approach mirrors the attitude of major central banks after the U.S. Federal Reserve and the European Central Bank scaled back plans for tighter monetary policy this month. Policy makers in Prague held the benchmark rate at 1.75 percent on Thursday, extending a pause for a third meeting and in line with investors’ bets and the forecasts of most analysts. Governor Jiri Rusnok said the global economic slowdown and a possible waning of domestic consumer-price pressures represented downside risks to the bank’s inflation forecast. He added that the central bank could still raise rates as many as a two times this year, or alternatively, hold them steady. Growing signals of a deeper slowdown in the Czech Republic’s main trading partners, combined with a decline in domestic consumption and weaker-than-expected wage data were the main reasons for holding pat, according to the governor. Consumer-price growth accelerated to its fastest pace in 16 months in February, with core inflation running at a record-high. 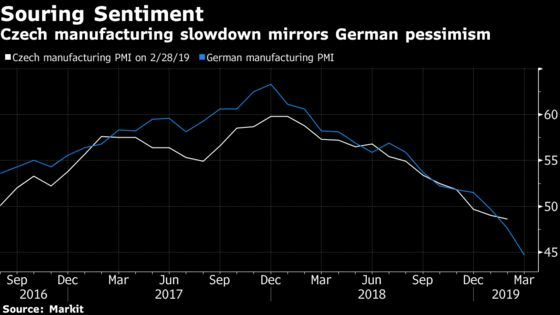 But several rate setters have urged caution over the effects of a slowdown in the euro zone, where Germany takes about a third of Czech exports alone. Like at the previous two meetings, two central bankers sought a quarter-point rate increase but were again outvoted. While the debate featured arguments for raising rates, there were also worries that the bank could be forced to cut them later this year. In that situation, Rusnok said he preferred stability over fluctuations. Other central banks in eastern Europe are treading carefully too. The meeting in Prague took place just two days after regional peer Hungary signaled caution by adopting measures that both curbed part of its monetary stimulus and introduced new steps to boost debt markets. The koruna remains a factor that may influence future rate decisions, Rusnok said. 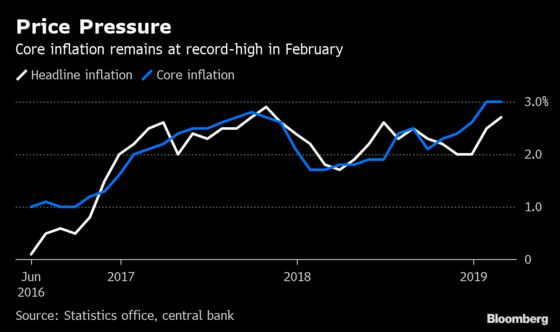 After its weakness was a key driver of last year’s rate increases, it has stuck close to the central bank’s expectations this quarter. The next chance to resume monetary tightening will be at the beginning of May, when rate setters will review the quarterly update of the central bank’s forecasts. That could give a clearer outlook for the future interest-rate path, and Rusnok said he couldn’t rule out holding borrowing costs unchanged or raising them. “For now, it certainly doesn’t look that we would consider a cut,” he said.